Rules for GSDs off lead? Today, whilst walking in the park, we came across a woman with two young german shepherd pups about 6 months old. The woman proceeded to yell at us above the barking of her dogs that she has been breeding gsd for 30 years and has NEVER let hers of the lead until they were over a year old as to prevent hip damage. she was very rude and adamant we should keep our pup on the lead for walks. Could you please advise? 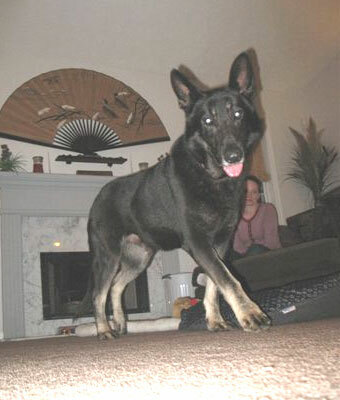 Comments for Rules for GSDs off lead? Just because the woman you met has a lot of experience, doesn't mean it's good experience or in any way knowledgeable. Her reasoning is bad, however I do agree it's not a good idea to have a young pup off leash anyplace they can run into other dogs who may or may not have good intentions -- one bad interaction and your pup can become dog aggressive for life. The hip damage reasoning is total hooey though. Joint damage in pups can be encouraged by forcing young dogs to run too much, as in jogging or biking with them before 18 months, but running on their own, especially on grassy/woodsy surfaces, is ideal for puppies. As long as you can ensure their safety. I have a beautiful 5-month old blue, and she will happily run around off the lead for about 45min. The puppy school I take her to told me I was over-exercising her and could damage her growth, and when I explained she had a lot of energy I wanted to reduce, they further told me it was because I was feeding her too much. However, I spoke to my local vet about this. She said my pup was, if anything, a little underweight and I should continue feeding her the recommended amount (I feed Royal Canin GSD Junior, approx 4 cups a day). The vet also queried about how I exercised. I explained that we walk on concrete/asphalt for 10-15 min and then she runs around off-lead on grass for 45 min. The vet said this was fine, if my dog was happy to keep up with me and it was on grass, then there should be no problem. I think you would be ok to walk her off-lead, provided the ground is reasonably soft. I have been walking my dog off-lead since she was 3 1/2 months old. As a safety measure its usual a good idea to keep your dog on a leash when other people or animals are around. Its very hard for a 4 month old to listen if something distracts them and they take off. I have an acre of fence and 4 Shepards that run daily as much as they want. I might not be correct but I think most dogs either come with good hips or not. When I have a pup I do limit exercise but its all about common sense. You can't restrict a dog from doing what they are suppose to do.